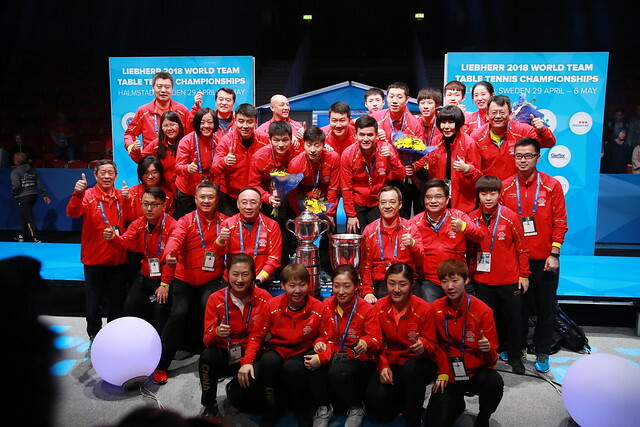 The Swedish team has rocked the Halmstad Arena on the opening day of the Liebherr 2018 World Team Table Tennis Championships that will be held from 29 April to 6 May 2018. Matilda EKHOLM (SWE) was the heroine of the Swedish team winning all her encounters of the day, including upsetting world number four FENG Tianwei (SGP), YU Mengyu (SGP) and recently crowned Commonwealth Game Champion Manika BATRA (IND). After a close defeat to the 2010 World Team Champion Singapore in the morning, the Swedish Women’s team recovered to defeat the in-form Indian team fresh off their Commonwealth Games Gold 3-1. The Swedish trio of Kristian KARLSSON, Mattias KARLSSON and Jon PERSSON thrilled the local crowd, defeating a pumped Romanian team of Ovidiu IONESCU, Hunor SZOCS and Adrian CRISAN 3-0 in the Men’s Team round 1 to start their World Team Championships campaign. The biggest upset of the day was the Egyptian Omar ASSAR defeating world number two and future club partner Timo BOLL 3-1. This was not enough to propel the Egyptians to a famous win, as the number one seeded German team battled their way to a tough 3-2 win in their opening encounter. The other favorites for the title, the Chinese and Japanese team both recorded easy 3-0 wins to show the rest of the field that they are in hot form. The round robin element of the tournament continues tomorrow, check out the matches of here day here. The 72 teams here in Halmstad are split into three divisions, with the top 24 teams in the Championship Division battling to become World Champion. The first stage of the event consists of the 24 teams being split into four groups of six teams. The top two team in the group progresses straight the quarter-final, with second and third placed team having a player off in the last 16 to move into the quarter-finals.